I've gone back to Saildocs as a source of GRIB data after a long break. So that I can use the GRIB overlay facility in OpenCPN. For the life of me, I can't seem to get the GRIBs I need. I can only get them 3 hours apart for one day, then they go to 12 hours apart no matter what I do. I know that the GFS model gives 3 hours apart out to several days out, or at least 6 hours apart, as I am able to get them via Passageweather. 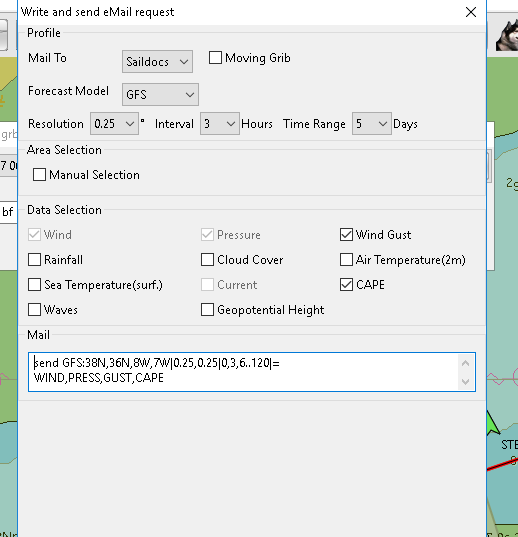 Can't help with the text for sail docs I'm afraid, but I just use Zygrib as it's easier to set graphically with cape and gusts etc than bothering with text. Very good display on Zygrib as well. Or pocket grib on android if using a local mbar free WiFi then copy across with something like filezilla. . Think both are grib 2. PS, why not use the opencpn plugin to create the message request? You need to be quick with the select and copy though, seems to unselect the text very quickly. Thanks for that. I thought the GRIB request function in O is not yet functional? Anyone using the NOAA resources directly? Works just fine in my w10 laptop, you just need to have an email program installed for the plugin to talk to, or copy/paste the "send GFS...." string straight into a web based email page. I noticed once you have the parameters set up if you select "manual Selection" it's easier to copy the text. I've installed and tried out zyGrib -- very nice!! Especially nice download function. I will use this for a while and take it from there. Thanks very much for the tip, Conachair. then all other models available depending on subscription level.